Imagine: you’re walking down the streets of west London when, suddenly, a Matchless motorcycle comes screaming past. At the helm is a teenage girl, her hair flying wildly behind her. If you didn’t see it with your own eyes, you might have doubted the passenger in the sidecar: but it is most definitely a collie seated beside its owner. You would have just witnessed a young Mildred Petre falling madly in love with speed. Mildred was born in 1895 to a very well-to-do family in Essex, England. But despite her posh education and upper class upbringing, Mildred was something of a rebel. Her older brother bought a motorcycle that slowly became her own. As Jean François Bouzanquet notes in his book Fast Ladies, she was often in trouble with the law for speeding, resulting in fines, bans, and even a short detainment in jail. She had her first child out of wedlock in 1920 and married another man six years later, the Honourable Victor Austin Bruce. It was a pairing that made sense. Bruce was a works drive for AC Cars Ltd. and had won the 1926 Monte Carlo Rally in terrifyingly snowy conditions. And it was their partnership that gave Mildred the connections she would use to bring herself fame. Her first car was, understandably, an AC Six. Having seen what her husband could do at the Monte Carlo Rally, she decided to try her hand at it in 1927 to see what she could do. Despite not having any other practice at racing, she performed incredibly well. She raced a full 72 hours without a wink of sleep and contested the full 1700 miles without a problem. When she crossed the finish line, she was sixth overall out of 45 entries and was able to claim the Coupe des Dames in the women’s division. That was some serious motivation, and it was a life changing event for Mildred. Where she hadn’t quite found her niche in the everyday world, she had come to find that she could make a career out of this racing business. And, like anyone who has just had their first taste of success, she wanted to jump right out and go for more. Which, in Mildred’s case, meant embarking on a whirlwind endurance tour. Immediately after Monte Carlo, she got the OK from AC to use the same car to see how long it could last. So, she and her husband headed out through Italy, Tunisia, Morocco, Spain, and France on a grand 8,000 mile challenge. Upon arriving in France, she decided that she hadn’t had quite enough time behind the wheel. So, like any reasonable person would do, she took it out to the Montlhéry circuit to rack up another 1000 miles before she finally returned to England to hand the well-loved car back to AC. Any number of us probably would have gotten sick of driving after spending thousands of miles behind the wheel in the span of a month. Not Mildred. No—AC realized the value of the globetrotting couple who had drummed up a lot of positive press for the company by cruising across multiple countries in the same exact, enduring car that had tasted success at Monte Carlo. So, AC decided to make the most of it. In July of 1927, they sent Mildred and her husband off again, this time with a journalist and an engineer to accompany them. They didn’t really have a goal in mind, other than to see how long they could last. As it turned out, they managed to set a record. After pushing through France, Belgium, the Netherlands, Germany, Denmark, Sweden, and Finland, the Bruces found themselves 250 miles north of the Arctic Circle. That was way farther than anyone had ever driven before (and was a record that lasted until 21st century technology made the drive a little easier), and they’d done it in the same car that had already been through a hell of a lot. They did what anyone would do. They planted the Union Jack in honor of their country and drove on back to England to make headlines. Endurance racing? That was just kind of their thing. In December of the same year, Mildred and Victor decided that they wanted to set a 10-day endurance record at Montlhéry. They teamed up with J.A. Joyce and pretty much stripped a new AC Six of all its extras (including the roof). Off they went, racing through thick fog without any lights on Montlhéry’s banked track. Their little 2-liter lasted for the entire 15,000 miles (which averaged out to about 68 mph). They were already making headlines, but they managed to do it again the night they finished setting seventeen different records, when they narrowly escaped their hotel as it burst into flames. Turns out, one of their mechanics had fallen asleep with a lit cigarette. Just one of the downsides of the mad endurance dash. Quite understandably, the Bruces needed a break. After all that driving, they needed about a year to recuperate, but they really couldn’t handle much more. In June of 1929, after a year and a half of itching, Mildred was back at Montlhéry, and she was ready to prove herself. She drove a Bentley 4.5-liter over the French track for 24 hours, averaging just under 90 mph for the whole thing. It was then the record for the longest and fastest single-handed driving, a title she wielded proudly. Back then, racing cars professionally wasn’t necessarily the career it can be today. Mildred felt she’d made her mark in the car world, so now it was time to set her sights on a new challenge. This time, she took to the water. She named her new speedboat Mosquito, and she was ready to start breaking records. In September of 1929, she drove the boat nonstop from Dover to Calais and back in a mere 1 hour 47 minutes—at the time, a record. The boat had almost destroyed itself on the route, but she had impressed the manufacturer by bringing them plenty of positive press. So, they replaced her boat for free. Which she used to break the 24-hour distance record. She raced a course around a lightship and a yacht moored in the Solent until she’d racked up 694 nautical miles (or, 799 regular miles) on the boat. Boating? Well, it just wasn’t really Mildred’s thing. In 1928, she’d joined the Mayfair Flying Club to experiment with speed in a whole new venue. 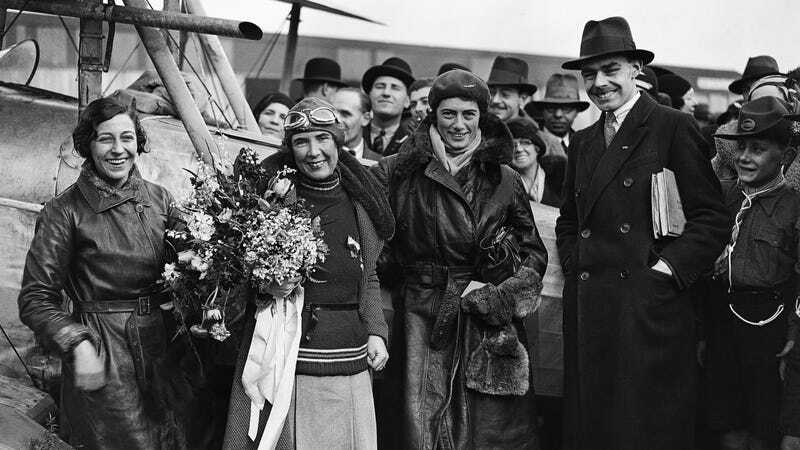 It wasn’t as easy to take to as racing cars or boats, but Mildred owned a Gipsy Moth plane by the start of 1930, even though it took her a few more months to get around to taking actual flying lessons, likely inspired by Amy Johnson’s completion of a flight to Australia. And a month after that, Bruce was flying solo. She had hardly flown before, but in September of 1930, Mildred got ready for her first journey. She bought a Blackburn Bluebird IV and had it specially outfitted for what she hoped would be a round-the-world solo flight. It was a pretty frought journey for Mildred. She sprung an oil leak over the Persian Gulf and sheltered with Baluchi tribesmen for days until she was reach by a search party—and then it took even longer to make the necessary repairs. She took off again and contracted malaria from monsoons in the Vietnemese jungle. But she pushed on, becoming the first person to fly across the Yellow Sea. And her flight across North America? Well, it was something of a mess. She crashed in Oregon, then in Baltimore. But Mildred reached New York City at the start of February in 1931, then made it back to Europe by the 20th. Although she did sail over the large oceans to minimize her risk of death, Mildred was still the first person to fly from England to Japan, the first to fly across the Yellow Sea, and the first woman ever to fly around the world alone. All things considered, that’s not a particularly bad line-up of distinctions. Flying really made an impression on Mildred. She attempted to break the air-to-air refuelling record in 1932, then joined the British Hospital Air Pageants flying circus in 1933, then attempted to set a record for the longest autogiro flight—but all three were failures. As she grew older, Mildred still loved adventure, but she was ready to start thinking about settling down. So, instead of daredevil attempts to set dangerous records, she instead turned to commercial aviation. She started off delivering newspapers in ‘34 before becoming a passenger shuttle service. During WWII, they turned to manufacturing and repairing damaged RAF aircraft wings. After WWII, though, her company wasn’t able to operate successfully after the founding of nationalized airlines. Mildred divorced her husband in the midst of war and fell off the radar, opting to live a more quiet, simple life. She was still enticed by an offer to test drive a Ford Capri Ghia at Thruxton when she was 78, then performed an aerial loop at age 81. But that’s all. Mildred Bruce passed away in 1990, age 94. She remains one of the most accomplished female drivers and pilots to this day, and it’s unfortunate that her name has fallen under the radar. She maintained her drive and passion throughout most of her life, setting more records than most of us could ever dream of in an era when organized racing wasn’t particularly popular or welcoming to women. She showed her mettle in some of the most challenging, dangerous arenas in the world—and that’s something we should respect even today.